Nothing says sweet, simple pleasure like the classics: gourmet chocolates and juicy, handpicked fruit. Imagine your loved one enjoying each delicious bite - all the while thinking of you. 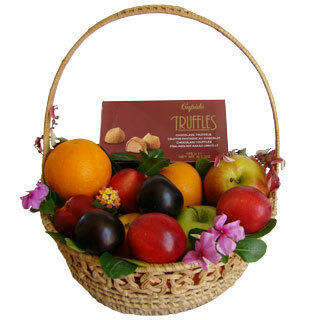 Your recipient will receive a basket brimming with the ripest seasonal fruit available along with a box of rich chocolate truffles. When you can't be there in person to spoil that special someone in your life, send a basket of life's simple luxuries. PLEASE NOTE: Basket shape & design and exact fruit selection may vary based on local availability at delivery location.